You may be forgiven for thinking that the imposing house standing next to the church had always been the vicarage, but this isn't the case. Although originally a wealthy yeoman's house, by the mid 19th century the fortunes of the Old Hall, or Church End House as it was also known, had waned and it had been split to provide 3 more humble dwellings. The current building, was heavily restored for and extended for use as a vicarage by Walter Morrison after he became patron of the parish. The initial restoration was completed in 1866 when the Rev George Audus moved into the vicarage and it was further extended with a northeast wing in 1874, to accommodate the needs of the Rev Thomas Clarke Henley and his family. The date stone, now very weathered and only just discernible. However the house may well be of earlier origin and this date may have just recorded its refurbishment by a new owner. Thomas was the son of Robert King (c.1540-1621), so the house may have just come into his possession, following his father's death, just a few years after his own marriage. "the poore of my parish of kirkby malhamdale ....... to be a stocke to remaine for the benefitt of poorest of them for ever"
It isn't known when the the King family ceased to live at what was at various times referred to as Kirkby Malham Hall, Kirkby Malham Old Hall or Church End. Thomas' elder son Robert (1618-1669) would be the obvious successor to the property and seems most likely as his second son Thomas settled at Skellands, another local property associated with the family.
" 2 or 3 yards above the mantle shelf, a room 6-8 feet square with no opening save into the chimney. He emptied a cart load of soot out it, and then found an old table, a chair, two silver spoons and two bottles of wine." 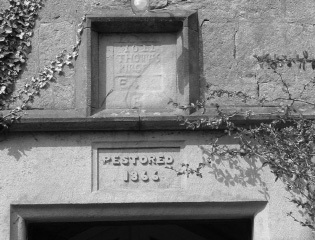 When Walter Morrison remodeled the house as a vicarage in 1866, this feature along with all the original internal structure of the building was lost. The writer of this newspaper article thought that the inclusion of this "priest hole" in the building would date the building as earlier than 1622, possibly around 1570-90 when the persecution of Catholic priests was at its worse point, and suggests it may have been built by Robert Kynge, vicar from 1585-1602 or even his father. The size and the inclusion of the furniture makes it look as though the space had latterly been intended as a place of refuge, but it may have originally been built as a "beef loft", a feature often found in traditional Yorkshire Dales houses, where meat from homebred livestock (pork, beef and mutton) was cured and dried. These were more usually a wooden structure in the floor above a fire, where smoke would cure the meat, whereas this structure sounded rather more substantial.
" ... the Lord Mayor of Hallifax is the present impropriator, who puts in the Curate, and allows him £20 per annum, which is all that he has, the very surplice fees going to the impropriator's tenant, nor is there even a house." " ... nor is there even a house." A Terrier of the Curacy of the Parish Church of Kirkby Malhamdale in the County and Diocese of York Exhibited in the Year 1770. Thirty pounds are paid yearly to the Curate by His Grace, the Duke of Devonshire or his Agent, being Impropriator of the Tithes, Mortuaries, Surplice dues and Easter offerings of the said parish are paid to the Curate, but part of Malham and Malham Moor pretend to be exempt from the payment of the same as being Tythe free. The Curate's House was left by Will to the Curate then being, and his successors for ever, by William Serjeantson, Esqr., of this Parish, after the decease of his widow, Mrs. Jane Serjeantson, who died some years ago. The House is built of stone, slated, contains one house stead, two small parlours, one pantry, one cellar, one wash house, four chambers, three garretts, with a Stable and Chamber over it; and a Coal or turf house adjoining the said House. There is also belonging to the said Building a garden and a small Court each surrounded by Stone walls. I have planted above a dozen Ash Trees in the Church Yard. The Church Furniture two pewter Flagons, two cups, the lesser supposed to have been given by the Parish without any inscription; the larger is the gift of one James Ward, of Ravenflatt, in this parish, to the parish and Church of Kirkby Malhamdale given in the year 1632. One Salver, the gift of one Ann Knowles of Trainhouse in the said parish. Three Bells and a Clock. The Church Yard fence is part repaired by the parish and part by the Inhbabitants adjoining it. The Clerk and Sexton's wages are paid by custom. "....... I give and bequeath to my said dear wife Jane Serjeantson the house in Kirkby in Malhamdale whereon I now dwell the yard or court thereto belonging the stable at the west End thereof and the Garden adjoining to the said Stable during her natural life and after her decease I give, devise and bequeath the same to whomsoever shall be then minister or curate of the Parish Church of Kirkby in Malhamdale aforesaid during his stay there and to his survivors for the time being forever, such minister or curate for the time being, paying doing and performing all Rents, suites, and services therefore due and of right accustomed to the Chief Lord or Lords of the see or sees thereof and keeping the same in good repair... "
However his wife Jane didn’t die until 1758, over 30 years later, plenty of time for the property to start to get run down, as maintenance wouldn't be a priority on a property she didn't own. 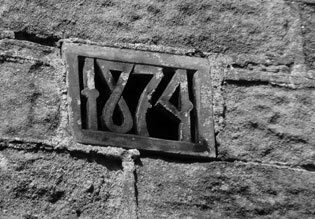 So the parish did have a vicarage to use from around 1758 through to 1786, but at some time between 1758 and 1802 they had somehow "mislaid it" and it isn't mentioned the next terrier in 1809, or ever again. ".. and keeping the same in good repair... "
As the parish couldn't even afford to keep the church in good repair during the latter part of the 18th and early 19th centuries, and the vicar wasn't paid a vast amount to enable him to attend to the upkeep of a vicarage himself, after around 90 years without much maintenance the vicarage probably was in a poor state. It is possible that the vicarage was in such a state of disrepair that it could no longer be occupied and may have been surrendered back to the Serjeantson estate, who were probably the freeholders, and the estate may then have repaired it and rented it back to the vicar. Whatever the case, by 1802 the Rev. John Robinson was tenant of a "Homestead and Garden" belonging to William Rookes Leedes Serjeantson, situated in Kirkby Malham and paying 5s per annum rent. This house is described as being at Kirkby Bridge End and may well be the one depicted in Thomas Girtin's 1801 painting of the village, standing where the Victoria Hotel (1840) was built by George Serjeantson. That it was later demolished and redeveloped as an inn by the family suggests that they probably owned the site and the previous property. 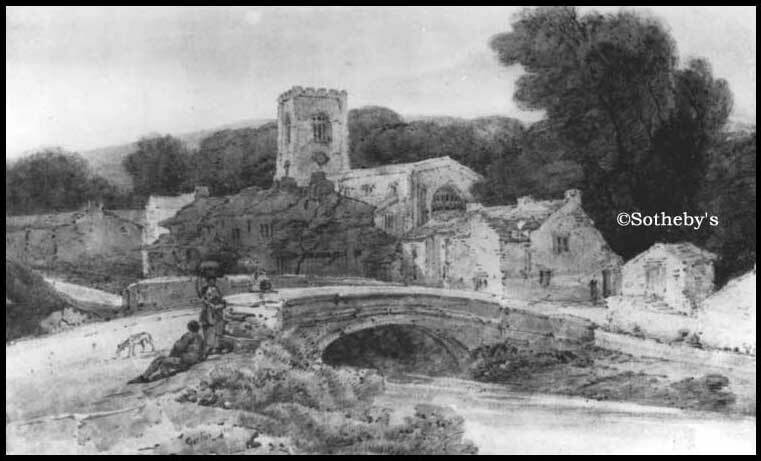 In Canon Shuffrey's "North Craven Churches" he suggests that the site of the old vicarage may have been by the beck, south of the bridge, where Bridge Croft now stands, which is also a possibility, as it is part of the same smallholding that had been associated with the inn since at least 1776. The Rev Robinson was succeeded in 1811 by the Rev Stephen Bland (1785-1862) who was the vicar when Morrisons bought the estate. He seems to have never lived in KM parish at all, living instead in Burnsall, where over a similar period (1811-1850) he also had another position, acting as assistant curate for his son the Rev Albert Cockshot Bland, vicar of Burnsall. On the 9th October 1813, a faculty was granted to cut down trees in the churchyard, and apply the produce towards building a parsonage-house, though the trees were removed as evidenced in the earliest photographs of the church, no house was ever built, though it may have paid rent for the curates. Bridge End is possibly the building where the Victoria now stands. 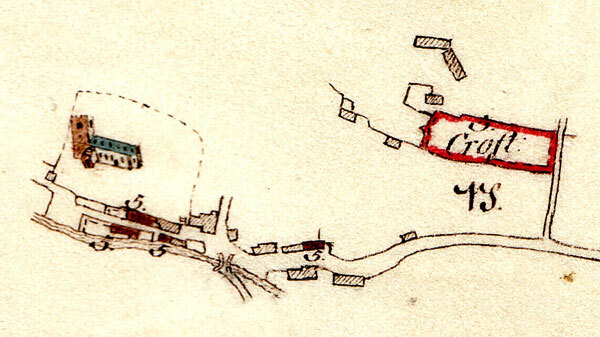 would have been in use as the vicarage, so not marked in red as part of the estate. The Rev Bland had a succession of curates to do much of the work at Kirkby Malham, his name rarely appearing in the parish registers, but it isn't clear where they lived when they were carrying out there duties until 1861, when the Rev George Audus (1798-1871) was acting as his curate in the parish and the census shows him living (or lodging) at Hanlith Hall, which was rented to the Prestons at the time. property was Thomas Lister (1828-1876) of Gisburn Park, 3rd Baron Ribblesdale. He put the property up for sale along with his Malham Tarn Estate in 1850 and in 1852 it was sold to the Morrison family. By this time the Old Hall had been split into three cottages. 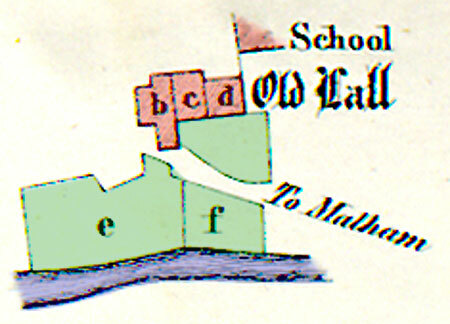 Details from the 1850 Lister estate sale show the division of the building. The Rev Audus took over as vicar of the parish after Stephen Bland died in 1862 and presumably he eventually required somewhere more permanent than lodgings to work from. Church End was inherited by Walter Morrison (1836-1921) along with the Malham Tarn estate on the death of his father James Morrison (1789-1857), and was the only property he owned in Kirkby Malham, other than a small cottage on the south side of the churchyard, and it must have been rather run down, judging from the amount of work he carried out on it. As a benevolent, and very rich, patron he would want to supply suitable accommodation for a Victorian parson, so the Old Hall was the obvious choice for his new vicarage, and conveniently next to the church. In 1866 Walter Morrison had the building totally refurbished and the three cottages made back into one dwelling for use by the current incumbent, allowing its occupation for a nominal rent. He retained little of the old building beyond the imposing porch, front facade and a small amount of 17th century wall at the back, the rest was a complete rebuild. The final result was much as you see today, with the unusual, extra set of windows to the upper floor, which would seem too close together to have had a floor between them. Perhaps the roof was raised to provide a full height second floor in 1622 and they were added for extra light? "......... vicarage building was used for cotton spinning; and a bobbin mill stood by the beck." The source of this information is unknown, but this is unlikely as the building is not close enough to the stream to use it as a source of power for spinning. Handloom weaving is much more likely to have been carried out and locally this had taken place for many years, and it would be the weaving of linen rather than wool that was undertaken. The small field behind the vicarage is recorded as "Hemp Garth" on an early 19thC map and stocks of flax and hemp are noted in documents going back to the at least the15th century. Bobbin making is basically a woodworking operation and usually requires a source of power such as water to, even if situated near the beck, the flow of this stream is very inconsistent and unlikely to have proved a suitable power source, though man powered production, using a pole lathe for example would be possible. However there is no mention of bobbin makers in the parish records or census. When George Audus died in 1871, the Rev Thomas Clarke Henley and his family moved to the parish and as his family expanded they probably required more space. When the old Grammar school, which stood between the vicarage and the church, was demolished in 1874, a new or enlarged wing was added to the East end of the vicarage. The rear wall of the vicarage garden appears to be the last remnant of this old grammar school. similar ones can be seen on the Buck Inn in Malham. "augmentation of the maintenance of the incumbent of Kirkby Malham and for a parsonage house"
During the early 20th century the lower floor of the additional 1874 wing was altered to incorporate a garage and in 1985, before the Rev Barry Newth moved in, more work was done on the house and the Victorian East wing was put out of use except for garaging and general storage to reduce the running costs. When his successor the Rev Mark I'Anson retired in 2008 the vicarage was again refurbished and split into two, an idea first mooted in the 1940s, to provide a smaller, more manageable home for the vicar and a second house to be sold or let for "local occupation". Vicarage. Dated 1622, restored 1866 [extended 1874]. Squared Coursed rubble, ashlar facing to porch, stone dressings, stone slate [actually Welsh slates] roof. All C17 windows are double chamfered with cavetto mullions on stools and all C19 windows have ogee mullions on stools unless otherwise stated. Three-storey porch in second bay: entrance has cavetto moulded surround, some C17 stones and an 1866 head and hood mould. 1622 date stone above with illegible lettering. First floor: C17 four-light window and drip mould above. C17 three-light window in gable, central light stepped. Terracotta finial to ridge. Right-hand return of porch: C19 two-light window in ground floor with hood mould; C17 two-light window on first floor and small single light with cavetto jambs above. To right of porch: two C19 ground floor windows, left-hand has 6 lights, right-hand has 5 lights; both have transoms and hood moulds. Four C17 windows on first floor all with 3 lights with a drip mould above which drops like a continuous hood mould between the second and third bays only. On the second floor are 4 unevenly spaced C17 two-light windows. Bay to left of porch is 1866. Rear contains three C17 windows: a 2-light and 3-light on the ground floor and a 2-light on the upper floor. The second floor was removed, so the upper 2 rows of windows are now part of the first floor. Rev Baron writing in the Parish Newsletters. The Yorkshire Dales by Marie Hartley and Joan Ingleby, JM Dent & Sons Ltd, 1956, republished by Dalesman Books. The Churches of the Deanery of North Craven by William Arthur Shuffrey MA., Pub. J Whitehead & Son, Leeds, 1914.